When planning for improvements or expansion of a park system, it is important to establish baseline design standards to ensure parks are developed in a way that promote enjoyment, safety, accessibility, comfort, and sustainability. The planning team developed specific design guidelines for the Dallas park and trail system based on the findings and recommendations of the 2015 Dallas Parks Master Plan. Parking lots should be representative of the experience the user will have at the park. The entrance to the parking area should be considered an entrance to the park itself, with trees, other plantings, and signage included. A minimum of 3 to 5 spaces per acre of usable active park area should be provided if less than 300 lineal feet of on-street parking is available. Park design should encourage access by foot or bicycle. Provide bicycle racks at each primary access point and at restrooms. The size of planting areas within the parking lot should be as large as possible with adequate room for maintenance to be performed safely. Water run-off should be diverted into a bioswale before entering the storm water system to reduce the impact of pollution on stream and creek systems. To achieve water purification and cooling, bioswales should be planted with native or other drought tolerant vegetation (see Planting). Restrooms are an important public amenity in high-use park facilities. The components, design, and placement of restrooms structures are important decisions to consider when specifying facilities. Restroom facilities should be safe, easy to maintain, and consistent with the park system vision. Interior surfaces and exterior surfaces of restrooms should be non-porous for easy cleaning (i.e., glazed block, glazed tile, painted block or painted concrete). The use of heavy concrete partitions between stalls is recommended. Specify only stainless steel restroom fixtures. The drain inside the structure should always operate correctly. If the facility is near an athletic field (such as, volleyball courts or a spray park) there should be an area outside the restroom with a faucet/shower and drain for users to rinse off. Include separate storage areas adjacent to the restroom structure to increase efficiency. Storage areas may house recreation equipment for fair weather activities and maintenance supplies for park crews. Skylights can maximize the use of natural light. Minimizing light fixtures helps prevent tampering, destruction and keep costs down. Facilities that are open in the evening should have lighting that is designed with vandalism in mind. A 5 to 6 foot apron around the structure should be provided to protect the building from debris and water. Trees should be avoided next to the restroom (see Plantings). Playgrounds should meet the needs of children of di erent ages and abilities. Playground facilities should ensure accessibility and safety for children of all ages. Parks that have playground equipment, sports fields and spray parks should be accessible to all children under sixteen. Play areas should be level to reduce the surface substance from slumping to low points. Consider using beach sand as a cost- effective, low-maintenance playground surface. Do not use engineered wood chip surfaces because decomposition will result in regular and expensive replacement. Play structures and equipment come in many different materials. Avoid specifying wood because: wood footings will rot, they are prone to termite infestation, the shrink/ swell defect of moisture loosens bolts and creates a safety hazard, and pressure treated wood contains chromate copper arsenate (CCA), a carcinogen. Wooden play structures that exist presently should be sealed every two years to prevent arsenic leaching. Natural play areas created from boulders, logs and land forms and playground equipment made from 100% recycled plastic or steel is recommended. Steel can become very hot in the summer months. If it is necessary to use steel, planting trees or other structures to shade the play area is recommended. The selection of site furnishings (i.e., benches, trash receptacles, light poles, etc.) should be based on an established standard for the City of Talent. The water fountains, benches, light fixtures and posts, signage and bike racks used in the parks should be consistent with those used in City civic spaces, along streets, and vice versa. Consistency in site furnishings will help establish an identifiable civic image, through the use of repeatable aesthetic elements, for Dallas and the park system as a whole. These furnishings should offer comfort, aesthetic beauty and be of formidable stature to prevent vandalism. Seating should be made from a material that is comfortable both in winter and the heat of summer while being able to withstand vandalism. Benches should be provided to o er places of rest, opportunities to experience views, and congregate. Drinking fountains should be available at a ratio of 1 per acre with the exception of mini parks (typically smaller than 1-acre) which should have one. Drinking fountains should be complementary to other site furnishings, such as benches, and be operational in freezing conditions. Consider drinking fountains that are friendly not only to human users but to canines as well. Signage should be located in every park in areas visible to all users. For example, place a sign at the entrance of the park that is visible to vehicular traffic, also place signs along greenways and trails to inform pedestrians and bicyclists. Signage should be easy to read and informative. Interpretive signs fall into this category as well. They can be useful in natural and historic areas . When used in natural areas these signs should be placed outside environmentally sensitive areas (i.e., wetlands and endangered habitat) and should be placed in areas that are accessible to all. transparency in public areas while also providing spaces for visitors to feel unmonitored. Vegetation that is directly adjacent to pedestrian areas should be greater than 7 feet or less than 2 feet in height. Shrubs located in the formal areas of a park that are taller than 2 feet should be limbed up to provide visual access to users and authorities. Built structures should be situated for easy observation from areas of frequent use and convenient access by police. Vehicle access to the park and amenities should allow authorities to patrol parks with some ease and proficiency. This access can also provide emergency services and maintenance. Sidewalks and paths intended for vehicle use should be at least 8 feet wide. Those that are concrete should be at least 7 inches thick. Rounded corners at park edges will provide protection from invisible intersections with adjacent areas. The use of native and other drought tolerant vegetation can enhance park design and support the ecological systems unique to the region. The following vegetation and irrigation guidelines assist in the creation of efficient, distinctive, and lush spaces. 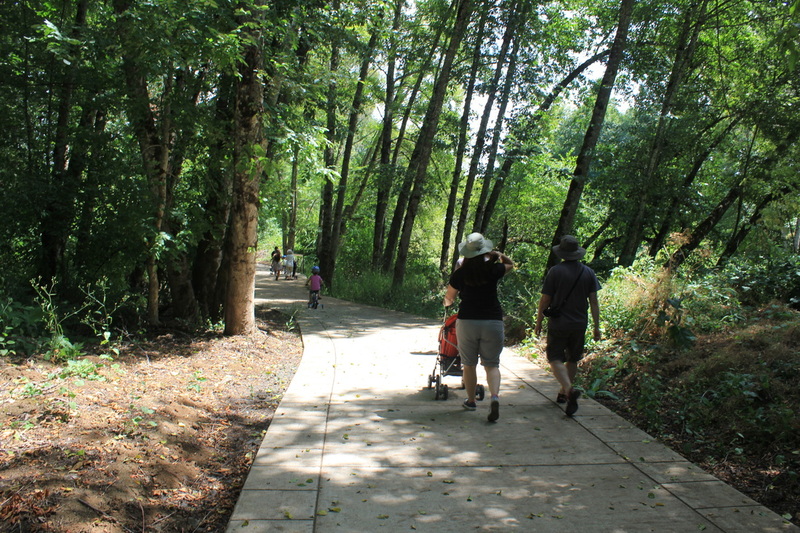 Vegetation along trail systems, waterways (creeks, rivers, bioswales and storm water) and within linear parks should consist of native plants and flora. The use of non-native species should be buffered by a broad band of native seed (i.e., turfed hair grass) between lawn and native vegetation. New planting areas should be designed to require no irrigation a„er establishment and irrigation reserved for areas such as sports fields. The use of native and other drought tolerant vegetation will reduce the need for irrigation. To establish plants, consider using a temporary irrigation system or hand watering. Design the irrigation system so that irrigation heads spray underneath plants or into them, not above them. Trees planted in groups increase the e-iciency of mowing and maintenance. When designing tree groups, it is important to provide a flush border around groups to ease irrigation and mowing. Planting areas in parking lots should be designed to provide continuous coverage within 3 years. The plants should be hardy, with a track record that indicates their survival in extreme environments. At least 400 cubic feet of the appropriate soil per tree in a planting strip is recommended. Trees should not be planted next to restrooms because they may provide unwanted access to the roof as well as create hiding places near the structure. Shrubs surrounding restrooms should be less than 4 feet in height and should be limbed up to allow visual access under them. Plantings should allow maintenance access to the roof. areas provide an aesthetic to the park while buffering natural and riparian areas. The process of maintaining and mowing turf should be efficient. Rough mown areas are mowed once or twice a year. There should be 15 feet between vertical obstacles in these areas. Maximum mowing slopes for rough turf or natural areas should be less than 5:1. Use native grasses such as Spike Bentgrass (Agrostis exarta), California Oatgrass (Danthonia californica) or Tffed Hairgrass (Deschampsia cespitosa), especially in areas buffering waterways. Groomed turf slopes should be less than 4:1, with less being preferable. Irrigation systems should take into account solar aspect, wind and topography to minimize the overuse of water. The minimum distance between vertical objects is 7 feet for mower access. Design for continuous mowing, taking care to avoid the creation of dead ends, tight corners or areas where a mower cannot easily reach. Provide a concrete mowing strip around vertical objects such as fence posts, signs, drinking fountains, light poles and other site furniture with a 12” minimum o-set between the object’s vertical edge and turf. Also, plant trees in groups (see Planting). Providing vehicular access for maintenance personnel is an important consideration. Curb cuts should be provided in logical areas such as turn-a-rounds. Curb edges should have large radial corners to protect adjacent planting or lawn areas. Herbicide use should be limited to promote stream health as well as health of nearby flora, fauna, and humans.